A freak October snow painted a shadow under the sugar maple on my lawn this afternoon. 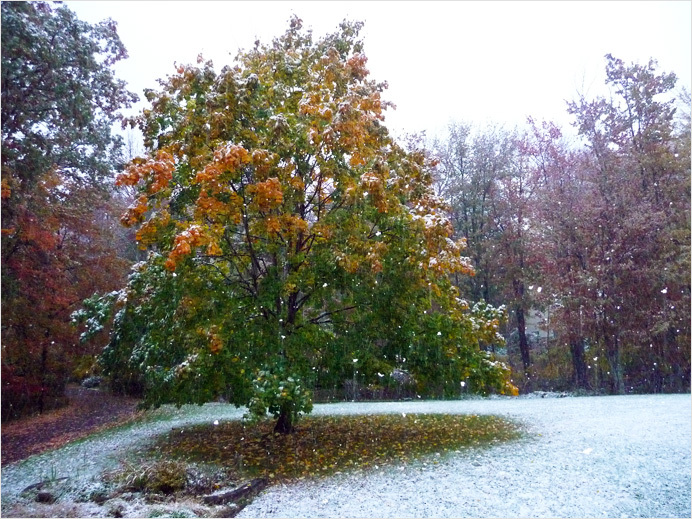 You can see three seasons in this picture: summer in the heart of the tree, autumn in the crown, and winter on the ground. I was glad the snow turned to rain by nightfall. A deeper snow in October 1986 snapped tree limbs all over Connecticut, snagging power lines and leaving some of us without electricity for five days. The last time this page saw snow was April 8, a mere six months and seven days ago. .